It all comes down to the right price when shopping for groceries. 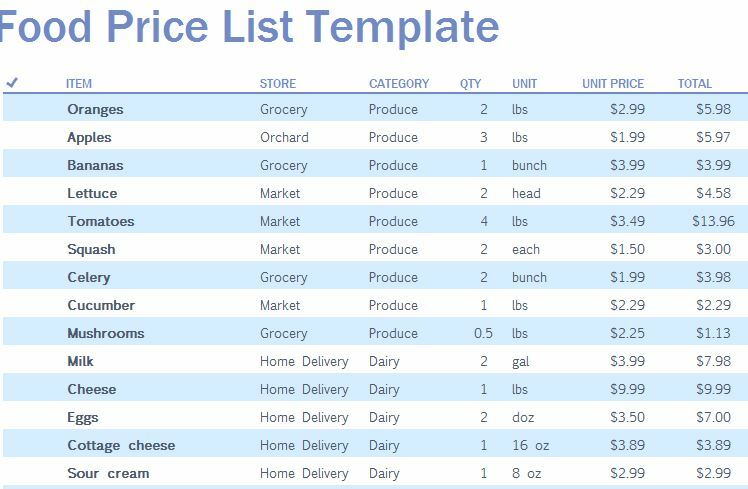 The free Food Price List Template can help you organize it all with just a few clicks of your mouse. If you want a solid shopping list that you can rely on to get you the best deals with the lowest total you’ve ever seen, then you need to try this free template. The document helps you create a solid grocery list of all the items you need for you home and helps you keep track of which stores have the best prices for it and when. If you need to go out for more bananas, then you simply check your template and know exactly how much you’ll be paying and where to go to get the best deal. Begin by creating a list of all the grocery items that you by regularly to compose a basic grocery list that you can rely on when you are completely out of food. You will list all these items in the first column of the template, under “Item”. Next, when you find the best price you’ve ever seen for an item, you will simply enter that store name or the address in the Store column. In this same format, you will enter the category, quantity, unit of measure, unit price, and total. You can also leave comments like needing a coupon to receive a set price or something like that. All the categories will be added and displayed off to the right of the template so you know what your money is being spent on. You can also see an absolute total at the very bottom of your table.